Note that users that installed this application prior to 25/9/15 will need to reinstall if they need to use the SMS function. Instructions here. I apologise for the inconvenience. 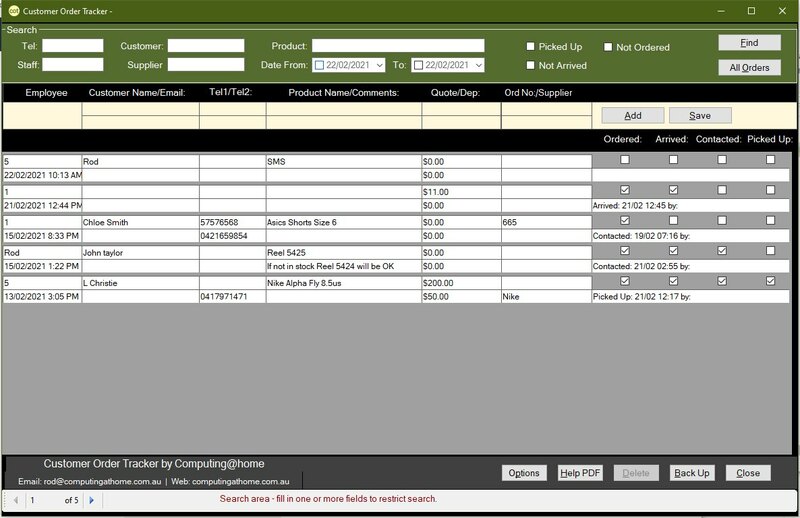 The Customer Order Tracker is a single form application, for the desktop, that tracks customer orders and quotes. It is suitable for retailers and wholesalers that receive orders from their customers that they can not immediately fulfil. It is a net-workable application, meaning that all users, no matter whether they are in the shop, warehouse or office, can follow the state of a customer order, and inform the customer of its progress if they enquire. It is a windows based application, and will install on XP SP2 or newer. Its main feature is its extreme simplicity of use. Even computer illiterate staff members will easily master its use. The top area is a search area, and searches are easy and quick. Most search fields are automatically "wildcarded" which means, for example a search for fred, in the customer field, will find Alfred or Frederick. To search by telephone number you would only have to put the last few digits in. You can DOWNLOAD the tracker for a 60 day full featured trial or read the help. If the trial is successful you can purchase the tracker licence for $199 US from our Kagi store. The licence will allow you to install the tracker on as many computers as you like, in the one location (Local Area Network). If you pay by credit card, Kagi will show on your statement, rather than Computingathome.